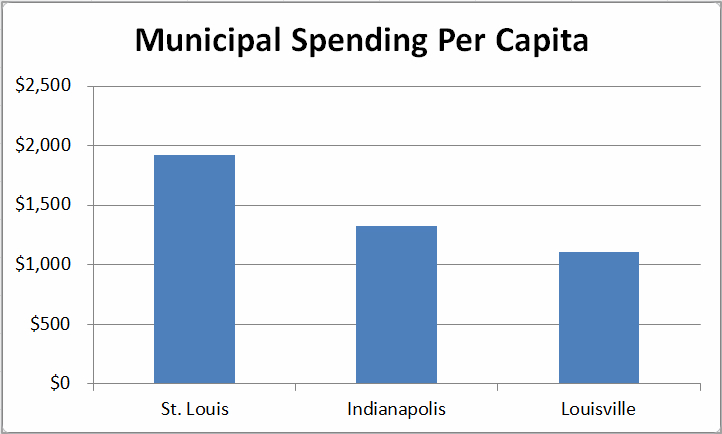 Better Together, the group studying our municipal governments, in their Regional Comparisonrevealed that St. Louis is spending much more per capita than Indianapolis and Louisville. Between St. Louis City, St. Louis County, the 90 municipalities in St. Louis County and the 23 fire districts of St. Louis County (No Metropolitan Sewer District (MSD), Zoo Museum District (ZMD), Great Rivers Greenway (GRG), Bi-State Development (Metro), or school districts) each year we’re spending $590 more per capita than Indianapolis and $815 more than Louisville. So if we spent the same per capita as Indianapolis is we’d be spending $778M less and in the case of Louisville, $1.075B less. In order to account for differences in the scope of the governments they left out St. Louis City’s Lambert Airport and water services and St. Louis County’s Spirit of St. Louis Airport. It’s doubtful there’s anything left out that can account for the huge difference in per capita spending. If there’s some other substantial difference in the roles of the governments being compared, please share. The cost of living is almost the same in all three places. The poverty rate in Marion county is higher than St. Louis City and County, so we can’t blame that. Certainly there are legacy costs from the city losing 500,000 people. There is also the costs of all the infrastructure we’ve burdened ourselves with in order to spread out. While what happened here happened to many cities, the fragmentation of the region exacerbated the forces at work. These forces are still at work, now threatening St. Louis County in a big way. With an extraordinary amount of fragmentation, we’ve rendered ourselves house-poor, and like the frog in the pot slowly getting the temperature turned-up, we haven’t realized it. Keep this in mind the next time a tax increase is proposed. Are we getting better services from our governments for all this extra money? If we are, it isn’t attracting people here, and the levels of service in Indianapolis and Louisville aren’t chasing people away. Since 1970 the population of Marion County (Indianapolis) has risen 14%. Since 2000 Jefferson County’s (Louisville) population has risen 9.1%. Since 1970 St. Louis City and County population has fallen 16.2% with the county almost stagnant and the city accounting for the losses. A variety of local government options and the small town feel with big city amenities are cited as selling points for the St. Louis region. It isn’t getting the job done, and it’s coming at a high cost to boot. In surveys citizens rate highly their satisfaction in the services delivered, but we should ask- can we get the same level of service for less cost? For the cost of fragmentation we could build a Metrolink extension every year. We could fund the Federally-mandated MSD improvements in short order. We could fund any number of services and small improvements in neighborhoods that would help raise our quality of life, our property values, and strengthen our communities. We could each have a few hundred more dollars in our pockets every year (much more for most of us than the income tax cut passed last session). It’s no mystery why they picked Indianapolis and Louisville. Indianapolis formed UNIGOV in 1970 merging the city, Marion County, and most of the municipalities of the county (A Super Mega Merger as defined by the Post Dispatch). In 2003 Louisville merged the city with Jefferson County while the other municipalities endured (Mega Merger). Looking at present spending is a snapshot. How it changed over time and before and after their respective reforms is important to look at too. The answer to whether big consolidations reduce spending in the literature is “sometimes.” Savings in one area could be shifted to other priorities so it looks like there’s no net benefit, for example. Or the dividends come over the long term as the curve is bent, a hard thing to prove though (What would Indy and Marion County be spending today if they hadn’t done UNIGOV?). Still the dramatic difference between St. Louis and the others indicates a problem that we should get to the bottom of. The rub is achieving substantial savings through reforming our local government structure. Would it take the Super Mega Merger or many smaller changes? St. Louis County has 82 municipalities under 25,000 people, so the biggest gains may be found there. Encouraging merging, disincorporation, sharing more services among towns, and combining one aspect or another for the whole city and county, like one health department, could be the best path. There’s no doubt, in addition to being dysfunctional, the status quo is also coming at a high cost. Hopefully in the forthcoming studies form Better Together we’ll find out where the money is going and thus be better informed on what to do about it. We need to continue to examine our governmental structure and consider how to get more for our money. In an era of scarcity and rising needs, we simply can’t afford this wasteful system anymore. *Originally published July 14, 2014 on nextSTL.